A typical Pollensa country style house, Villa Almendra Boi (formerly known as Villa Boi) has good views over the surrounding landscape to the mountain tops peeking in between the trees. This 2 bedroom villa is only a few minutes' drive from Pollensa Old Town with the facilities and beaches of Puerto Pollensa and neighbouring Alcudia also within easy reach. The house has pleasant grounds, perfect for lazy days spent by the pool, and a traditional interior. Air conditioning/heating in both bedrooms and WiFi and included. The perfect choice for a romantic getaway. 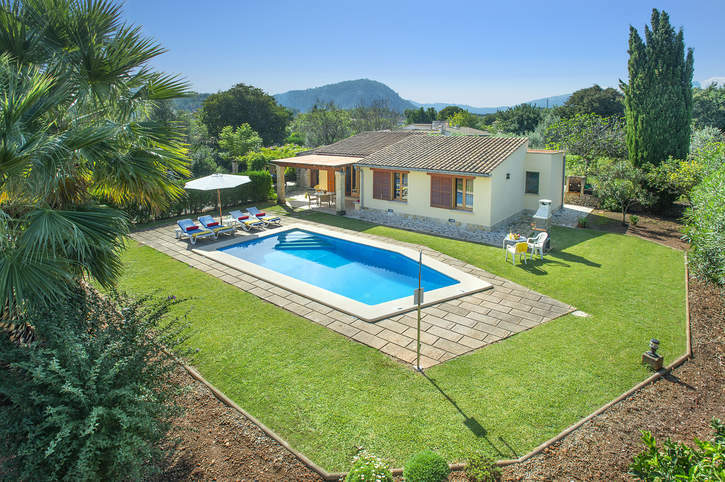 A delightful countryside setting, only a few minutes from Pollensa Old Town. The garden and pool area are screened by a row of cypress trees for a good deal of privacy, and the grounds are dotted with orange and lemon trees. The lawn and sun terrace provide plenty of space to sunbathe, and there is also a table and chairs on the shaded part of the terrace for alfresco dining. The brick BBQ is to one side of the garden. Villa Almendra Boi has a private driveway and parking area for your hire cars, with the main entrance at the front of the house. The combined, split level lounge and dining area has ample seating and a table and chairs, with the wooden beamed ceiling giving the villa a real Spanish atmosphere. Patio doors from the dining area open onto the shaded terrace overlooking the pool. The kitchen is fully equipped, and even has a small breakfast bar with stools for your morning coffee. A back door from the kitchen gives access to the utility room. This charming villa has 2 bedrooms, a double bedroom and a twin bedroom, which share the facilities of a separate bathroom. Villa Almendra Boi is in an ideal location, only a few minutes' drive from Pollensa (Pollenca) Old Town. The town has a good choice of traditional Spanish restaurants along its cobbled streets as well as some spectacular scenery to enjoy. Nearby Puerto Pollensa (Puerto Pollenca) has a much more contemporary vibe as well as a large sandy beach. A number of alternative eating places, beaches, golf courses, a waterpark and various other local attractions are all within easy reach both here and in the popular neighbouring tourist resort of Alcudia. The old towns of both Pollensa and Alcudia and the plaza, or square, at Puerto Pollensa are all host to a lively weekly market. Here you can buy local produce and souvenirs to take home, plus it's a great opportunity to mix with the locals. You'll also find a choice of mini markets and supermarkets in the surrounding area where you buy everything from daily essentials to a weekly shop. There is a good restaurant reachable within a short walk if you don't want to rely on the car to dine out. However, a trip into Pollensa Old Town is a must. The eating places here offer authentic Spanish cuisine and a lively ambience, especially in the evenings. Or, if you prefer something more contemporary, head for Puerto Pollensa which has a number of stylish bistros along its famous Pine Walk, overlooking the sea. Alcudia also has a large choice of places to dine, ranging from a traditional paella in the old town to a fine dining experience by the port. There are a number of excellent beaches around this part of the island. If you're looking for a large, lively beach, visit Puerto Pollensa or Alcudia. Or, if the seclusion of a smaller sandy cove is more your scene, Cala San Vicente, a little over 3 miles north, has 2. But if you're feeling really adventurous, the beautiful hidden beach of Playa de Formentor is around 9 miles around the coast. The journey around the hillside is not for the faint hearted but it does offer some spectacular panoramic scenery, and the beach is lovely too! In the neighbouring resort of Alcudia you'll find the popular Hidropark which has a number of water-based rides and activities for all ages. From the spectacular underground lake at the Caves of Drach to the stunning scenery from La Victoria Monastery, there's something for everyone in Majorca (Mallorca). History enthusiasts should definitely visit the old towns of Pollensa and Alcudia. Or, if you really want to see more of what this beautiful island has to offer, the Gothic Cathedral, Aquarium, art gallery, museums, restaurants, shops and nightlife of Palma make a great day trip! Golfers are well catered for with a choice of 2 good courses in the area. The nearest is Golf Pollensa, around 15 minutes' drive south, on the other side of the Puig de Maria hillside. There is also a course on the other side of Alcudia. Water sport and boat hire facilities can be found in Puerto Pollensa and Alcudia. Walking and cycling are also popular activities, especially in Pollensa as you can really appreciate this superb countryside setting. Villa Almendra Boi is not available to book for season as it is sold out. Take a look here at the Majorca villas that are currently on sale. Absolutely wonderful villa. Immaculately kept, both villa and garden. Relaxing and wonderful location near to both Pollensa old town and Porta Pollensa. The pictures of the villa didn't do it justice. It was even nicer than we had expected and well equipped. It was a lovely villa, happy with the quality. Kim, the rep was very knowledgeable (having lived there for 10 years) and gave us good ideas of places to go and things to see. I like the fact that your reps actually live in the country (Jo in Menorca last year had lived there for approx 10 years as well) as they have a lot of knowledge of the country. Villa was on a really spacious plot which we weren't expecting. I've used Villa Plus several times in the past and we also used this villa in July, so its our 2nd time this year! Great villa, with everything you need. Lovely swimming! One of the best Villa Plus villas we have used over the years. Had a fantastic first holiday with villa plus, will definitely be using your company again!! Absolutely fantastic holiday experience from beginning to end. We would not hesitate to recommend Villa Plus to anyone. The service was amazing. Every aspect of the holiday exceeded our expectations and we will definitely book with Villa Plus again in the future. The villa was very clean, and had everything in it that we needed. The owner was there as we arrived, and came to clean the pool during our stay. The maid was very thorough and cheerful. We have been staying in villas in and around Pollensa for over 20 years, and this villa was among the best. Great location, nice size and spacious garden. We would certainly use Villa Plus again. Absolutely fantastic holiday and all the family felt the same.We fell in love with the Villa and the area. I would have no hesitation booking another holiday via Villa Plus. I will recommend Mallorca, Pollensa, Puerto Pollensa and Villa Plus to as many people as I can. Holiday exceeded our expectations. Directions were very detailed to villa. Villa was gorgeous, very clean, beautiful pool and well stocked. It even had 'extras' that they didnt have to supply like books, playing cards, extra table tennis balls...lots of little touches and beautifully accessorised interior. Ideal for families. My children remarked on the first day how it felt like home and settled in right away...it had a very relaxed atmosphere. We happened to meet the owner who was very friendly and helpful. The Villa Plus rep was knowledgable about the local area, friendly and approachable. He even went the 'extra mile' and lent us an extra playstation console. Couldn't recommend this Villa, the holiday or Villa Plus highly enough. Fantastic all round!!!! Lovely villa overall and perfect for our family. Great location. Nice modern interior. A good quality holiday which met all our expectations. Very relaxing. We would go again. Your rep was at the villa when we arrived and she was helpful and polite. An excellent villa, we would definitely use your company again and will be recommending you. We have no recommendations for improvement because we thought it was all excellent. Very professional and personal service from the UK and Spanish staff. We are delighted with our first Villa Plus holiday all round. Thank you!